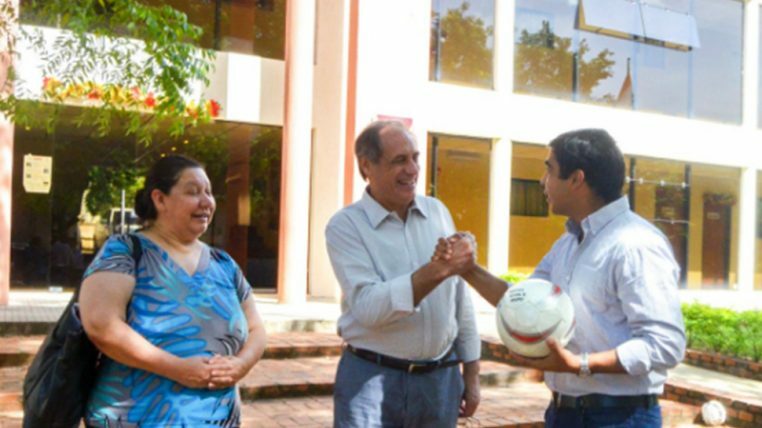 Recently, Fernando Pfannl and Celsa Acosta, coordinators of the Cerrito Poverty Stoplight initiative, met with Rodrigo Medina, General Director of Sports of the National Secretariat of Sports, in a meeting that had as objective to inform the Secretariat of State about the work that is being developed with the initiative, in order to bring sports activities to the indigenous communities of Benjamín Aceval. During this meeting, the Fundación Paraguaya representatives presented the Cerrito Poverty Stoplight initiative and the actions that are being carried out in the community of Cerrito through the Poverty Stoplight methodology, in order to improve the quality of life of the those 1000 inhabitants families , of which approximately 700 belong to the Qom indigenous community. The idea is to organize sports activities for the benefit of local families. Celsa Acosta talked about the actions that were carried out over the past year, including a holiday camp with children, and talked about the intention of having initiatives that involve young people, so sports activities would generate moments of recreation. Fernando Pfannl also said that, through the Poverty Stoplight methodology, it was found that young people in the community lack more sports and recreational activities, and that having the collaboration of the Secretariat will be a plus to continue working in the area and reactivating the life and self-esteem of many young people. On the part of the National Secretariat of Sports, an openness and interest was seen in bringing sports inclusion to the communities that are part of the Cerrito Poverty Stoplight initiative, so they will send technicians to visit the community for the elaboration of an action program.